Simmons Skis are engineered to provide incredible control. Designed to flex through bumps and ruts, the Flexi-Ski absorbs the shock normally taken by your arms and legs. Darting is eliminated. Turning is improved as your sled holds the corners. 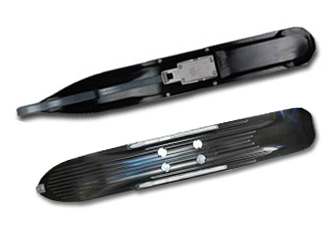 The Flexi-Ski is the finest trail ski on the market. It also offers tremendous flotation in deep snow and increases your ability to sidehill, making it the best all-around ski available. Made from TIVAR® UHMW plastic.